It is 66cm tall and 48.3cm wide. 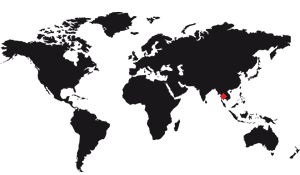 It's really small, when you think of its popularity around the world. For comparison the Manneken-Pis in Brussels is only slightly smaller: only 55 cm. Two statues internationally known, two statues of modest size: It is the proof that one does not need to be big like the statue of the freedom to have fame! Buddha is represented in a sitting position, his legs are bent, the left under the right, and he has an attitude of meditation. This is an original attitude because meditation has never been put forward in traditional Thai art. In fact, when we compare our style with those we know, any time and any region, we can only note that if the style is that of the end of the fourteenth century in the North of Thailand, which is consistent with its known history. As for the meditative attitude, the specialists are more circumspect because we only find such notions in Southern India and Sri Lanka. It may sound strange, but it is quite possible that the idea of ​​the statue comes from there, while his sculpture would come from the North of Thailand. The statue is placed on an oversized pedestal that rises to a height near the ceiling (and it is high in the ubosoth!) Initially composed of two levels, King Rama III had an intermediate floor added. The whole is made of wood covered with gold leaf and offers the view of the visitor a particularly Baroque appearance. But it must be said that it is impressive. According to accounts that seem plausible to local historians the statue was discovered by chance in 1434, year in which the lightning fell on a chedi in the city of Chiang Rai, in the north of the country. Nowadays this city is the second largest in Thailand, for about a million inhabitants. Inside the chedi, a building in the shape of a point, one discovered a stucco statue (improved plaster allowing the reproduction of material like the marble, but with a great ease of application) It was placed in a sanctuary, appendix d a temple of the city. The fact is that after a while the stucco was damaged, showing a green color under the coating. The monks then removed everything that wrapped the stone, which revealed the totality of a beautiful jade Buddha, very well worked. No one knows where it came from, who ordered it, who carved it, let alone why it was placed inside the chedi, but this discovery was not trivial. The statue was so well known that the king of the region, whose capital was Chiang Mai (not to be confused with Chiang Rai), wanted to move it to his capital. But legend has it that when the elephant carrying the precious cargo arrived at a crossing between Chiang Mai and the city of Lampang, he invariably chose Lampang. 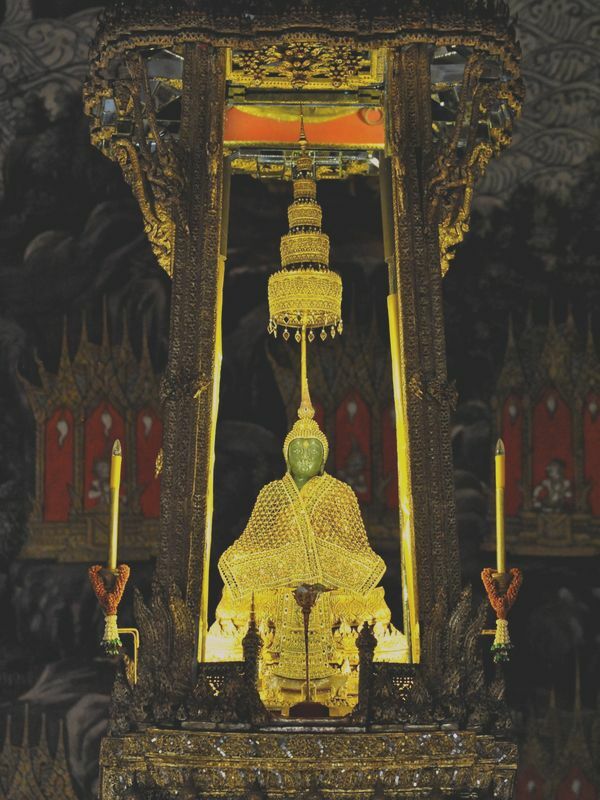 The king saw there an omen and decided that the Emerald Buddha would be installed in Lampang. He stayed there until 1468. In 1468, the king of the Titok region, whose capital was still in Chiang Mai, had the statue brought near him. She was installed in the eastern niche of a stupa, chedi Luang. Some time later, in 1551, the king in office at that time died without a male heir. His daughter had married a king of Laos and had a son. It was the latter who agreed to take the post of king. If we tell this here, it is because his arrival on the spot was not long: At the death of his father he went back to Laos, to Luang Prabang, and brought with him the statue. He never came back, despite the promise he had made, and did not send back the Jade Buddha either. It must be said that in 1564 the Burmese attacked the kingdom of Laos and conquered its territory. The king had to flee to Ventian, with the statue of course. Ventiana became the capital of his new kingdom. This is where the Emerald Buddha spent the first part of his life, since he stayed there for 214 years. In 1778 a general of the Thai army conquered Ventian. 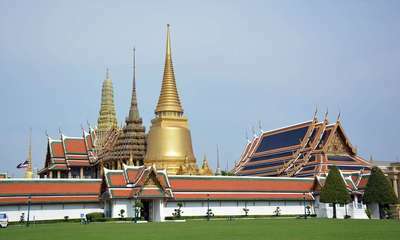 It was the future Rama I, the founder of the Chakri dynasty, of which there is much talk about the temple of the Emerald Buddha. Rama 1 brought the statue back to her new capital and built a special temple near her palace. He regarded him as the protector of Thailand, and it is from this period that dates his sacredness. In fact the temple itself does not have a great importance, it is rather what it contains which has: the Emerald Buddha. Discovered by chance in the 14th century, it is a beautiful jade statue representing Buddha in a meditation position, a rare stature in Thailand. There is no real explanation for the importance of the religiosity of this statue. Carved in the fourteenth century, discovered by chance in the fifth, its beauty is its main asset. Upon her discovery, she was put under cover in a temple in Chiang Mai, the local capital, under the protection of the king. This is undoubtedly the origin of the interest of the population for this statue. Because it was moved to Lampang, then Ventian and each time the king had a temple built for this statue. The more time passed, the more it became important because the king himself took great care of it. One imagines that it is the fact that she is under the protection of the king that provoked her popularity. Nowadays it is the most revered Buddha of Thailand.